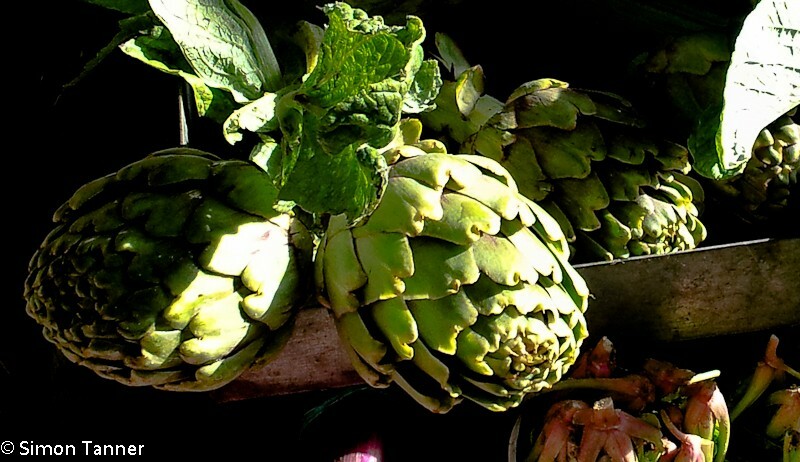 Easter marks the beginning of the end of the artichoke season, so take advantage to snap them up before it’s too late. To keep you busy we have a double helping today. First baked in the oven with potatoes, and then as part of a somewhat lighter Sicilian classic, frittedda. Potatoes play the perfect foil in the first recipe, doing a great job of soaking up the artichoke juices, olive oil and pecorino, while also providing attractive textural contrast – crisp on the bottom of the tin, fondant in the middle and crunchy on top. This makes an excellent dish on its own, but could also be served as a side to some lamb chops. Prepare the artichoke hearts (see here) and cut them in half. As you prepare each artichoke half, place it immediately in a bowl of water into which you have squeezed the juice of two lemons. Once they have all been trimmed, remove them one by one and slice thinly lengthways, and place the slices back in the lemony water. Once the artichokes have all been dispatched, drain and cook in lightly salted boiling water for about ten minutes. Drain and set aside. Grease a baking tin and cover with a layer of potatoes (use one third of them). Season with salt and pepper, a good sprinkling of breadcrumbs and grated cheese and a drizzle of oil. Add a layer of artichokes (use half of them) and season as for the potatoes, but adding chopped parsley and garlic. Add another layer of potatoes and another of artichokes, seasoning each layer as before. Add a final one of potatoes. Before seasoning the final layer as the others, pour over 150ml of water. Cover the tin with foil and place in the oven for 60 minutes. Turn the oven up to 200°C and remove the foil. Put back in the oven for a further 15 minutes or until the top is golden brown. Remove from the oven and leave to rest for five or ten minutes before eating. 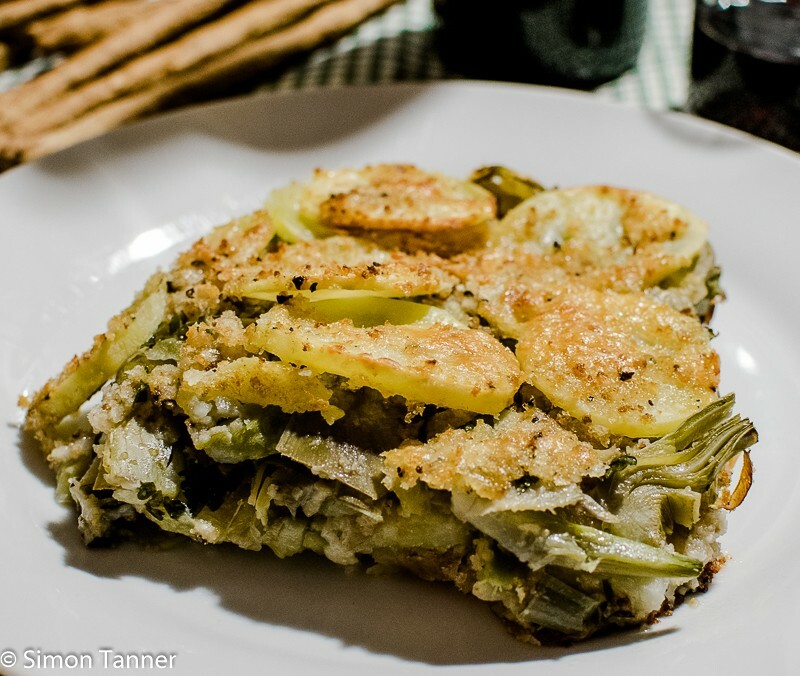 Our next recipe, frittedda, for me is spring on a plate. 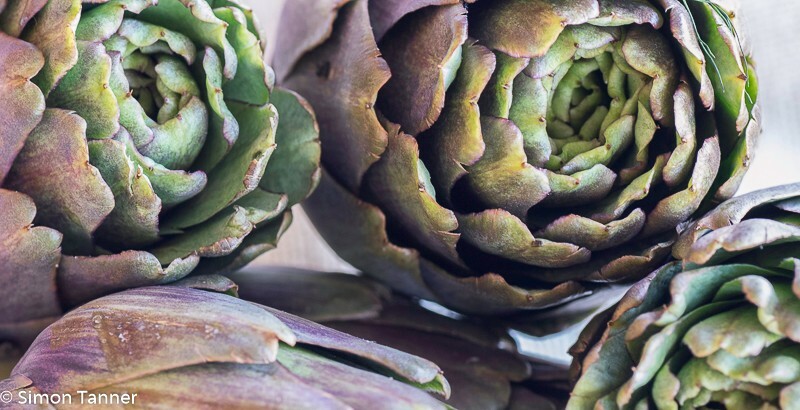 When I go to the market and see piles of artichokes, broad beans and peas, it invariably coincides with a barely perceptible but crucial change in the air, the light and the temperature, and it does wonders for my mood. The same cannot be said for the mood of my offspring, who know they will be called upon to shell the peas and beans. Child labour, I know; terrible isn’t it? Recipes exist for this without the vinegar, sugar and mint, and if you prefer the stripped-down version, simply leave them out. It will still taste good, but not as good. Having grown up on mint sauce, the vinegar-sugar-mint combo is an old friend, and here its presence is vital. Leave it out and you will feel something is missing (as of course it is). It will be like pork pie without mustard, bacon without HP. Not surprisingly, in the full-blown version, frittedda, essentially being spring vegetables with mint sauce, also makes an excellent companion to roast lamb. Prepare the artichoke hearts as above, but cutting them into four or six segments (depending on size). As you prepare your segments, place them immediately in a bowl of water into which you have squeezed the juice of two lemons. 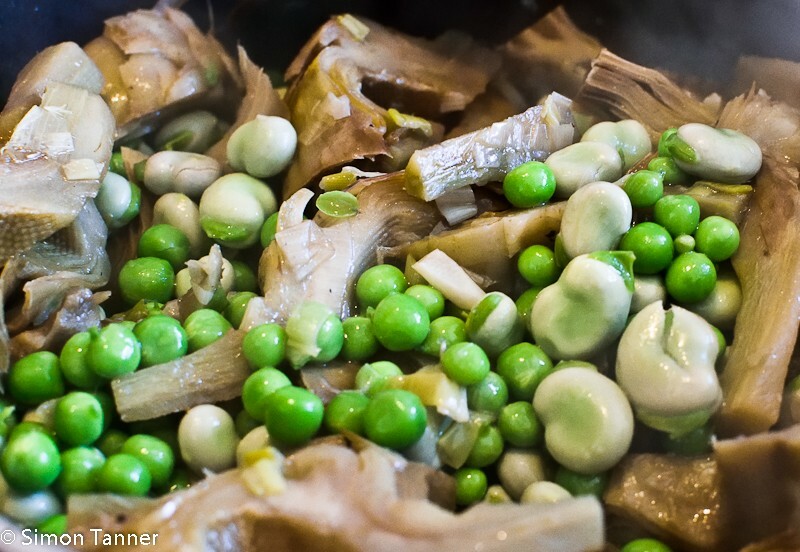 Shell the broad beans and peas. Gently fry the onion in a non-stick pan (for which you have a lid) for a couple of minutes in two or three tablespoons of olive oil. Add the drained artichokes, and cook for a couple of minutes, turning to coat well in the oil. Add the broad beans, peas, a good pinch of salt and a glass of water. Cover and cook over a low heat for about 25 minutes, adding more water if necessary. When the vegetables are all cooked and the water absorbed, take off the lid, turn the heat up to high and sprinkle over the vinegar and sugar mixture. Cook for a couple of minutes, stirring all the time. Remove from heat, season to taste and stir in the chopped mint. Leave to cool. This is best eaten at room temperature or cold. It is even better the next day. 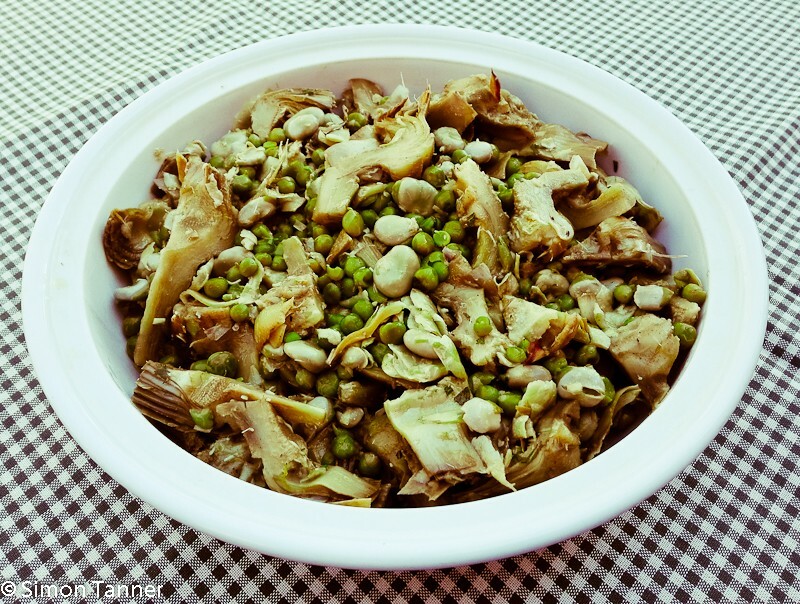 This entry was posted in Ingredients, Recipes, Vegetables & side dishes and tagged artichokes, carciofi, frittedda, vegetable, verdure by hungryenglishman. Bookmark the permalink.